My neighbours beside me are tearing down their house and building a new one. They contacted me a few weeks ago. They told me there was a possibility my large fir tree adjacent to their property might be damaged but they would try their best to save it. They asked me to write a letter indicating I wouldn't sue them if the tree died as a result of the construction. I wrote the letter. A week later, they contacted me again to tell me the arborist recommended the tree be cut now, as it was otherwise very likely to fall on my house. The second piece of information arrived the day I left for my holiday. I felt manipulated; there was a big difference for me between my tree might die (the circumstances under which I wrote my letter) and my tree needs to be cut down now. I spent time suffering, being upset. Then, through a conversation with someone who doesn't like to see me suffering, I got a different perspective. I have a choice. My choices are: keep the tree, and accept the high risk that it will fall on my house, or have it cut down. The decision became very simple. I gave approval to have it cut. They took it down yesterday before I arrived back home. The suffering is gone. I have a bit of grieving but it is minor. My yard is very different. 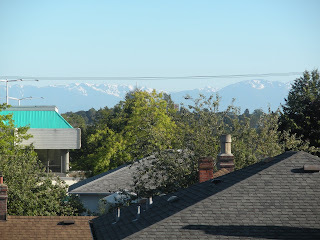 I have a view of the Olympic mountains. There is a lot more sunshine on my deck. We experience situations like this every day. Often, we choose to suffer, complain, and feel hard done by or affronted by the actions of someone else that have impacted us. We can get a lot of mileage talking to others about it. No matter how much sympathy we get, however, at the end of the day we don't feel powerful. We feel like victims. In almost all situations, we have a choice. Making the choice gives us power and frankly, feels a lot better. Who wants to suffer and feel victimized? Far better to embrace the change, and move on to what's next. who are you for others?